My daughter Lily and I recently spent a leisurely afternoon exploring the booths of a local antiques store. We were delighted to find lots of vintage dollhouses for sale on the second floor of the shop, and she thought we should buy one (or three). I was captivated by this rare Craftsman Bungalow (above) but didn’t have $249 to spend on it. I decided she was right. I couldn’t resist. I bought it and brought it home. I knew nothing about the house, so I did a little research and learned it was made by the American Can Company. Lily and I love our new (old) dollhouse. She thinks we need to start collecting them now and jokes that I could start a Hooked on Dollhouses blog, but I haven’t even figured out where to put this one yet! It’s been moving from room to room as I try to find the best spot for it. It’s too big to fit on any of my bookshelves, the piano, or anywhere else I had thought might work. At the moment it’s sitting on the family room floor, but I think it needs a table or stand of its own. My Son's Small Bedroom Makeover: The Final Reveal! My grandmother had a an old wooden dollhouse I loved to play with. One of my nieces got one for Christmas this year and I found the cutest miniature furniture and accessories, including a nice oriental rug, a set of pots and pans for the kitchen, and a toaster WITH two slices of bread! 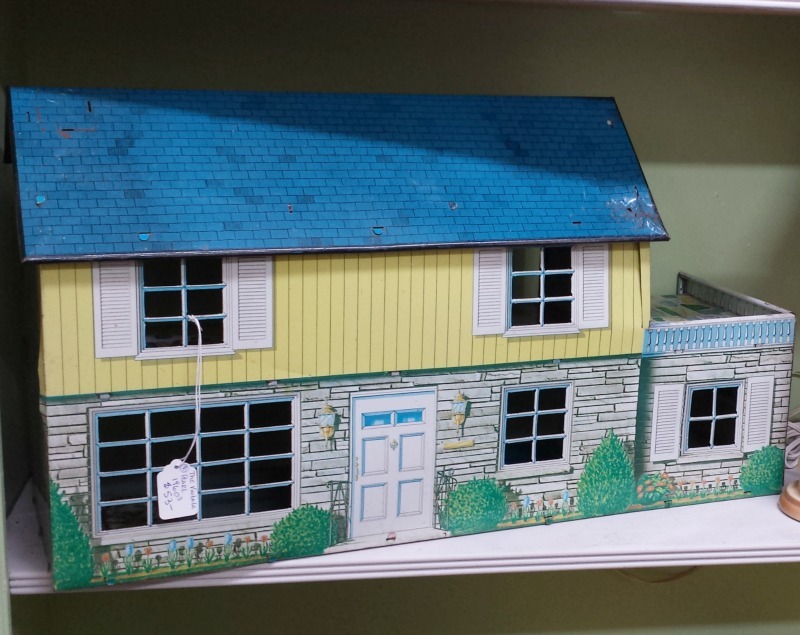 We have a dollhouse at my work (pawn shop) which is pretty cool, too. My mom has that exact one. She bought generic plastic furniture and she brings it out for the grandchildren. I saw one used as a Christmas decoration with a wreath on the door and some felt snow on the roof. I thinK i may ask her to borrow it for next year. I had a tin lithograph similar to yours, with wall and floor furnishings, in the early ’50s. I spent hours designing floor plans and moving furniture. Being military we never owned a home until I married so my Tin Colonial was the dream house I fondly remember and based my Traditional design aesthetic on! I still love it. Today I work in the interior design field so you may have sparked your daughter’s interest more than you realize. Our granddaughter is extremely artistic and she plays at our home with my mother in law’s wooden Victorian dollhouse. Her interiors are even better than mine. ?? my mother in law never had a dollhouse growing up in the ’30s and always talked about getting one so for Christmas one year we got her one. She made rugs and quilts and bought furniture at bazaars and craft fairs! Me too! I was also an army brat and that has sparked my lifelong curiosity and love of houses. I spent hours playing with my dollhouse that is almost exactly like this one. 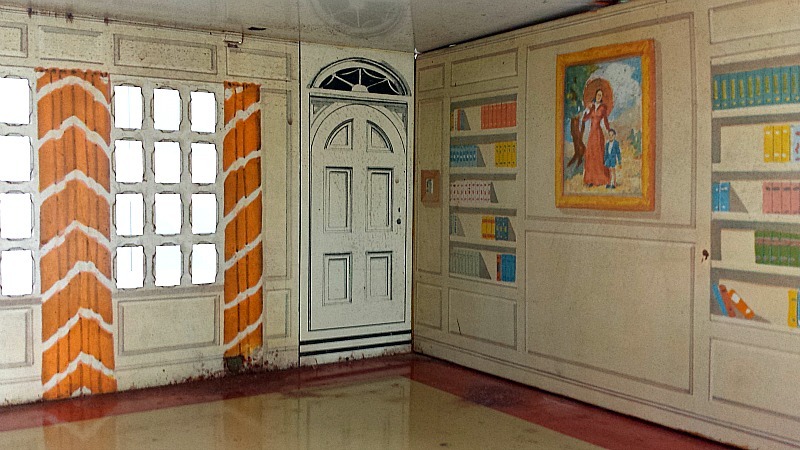 Have you ever seen the dollhouses in the Smithsonian? Fabulous!! Hooked on Houses is not a restrictive term. you can also be hooked on dollhouses, or Miniatures if you prefer. 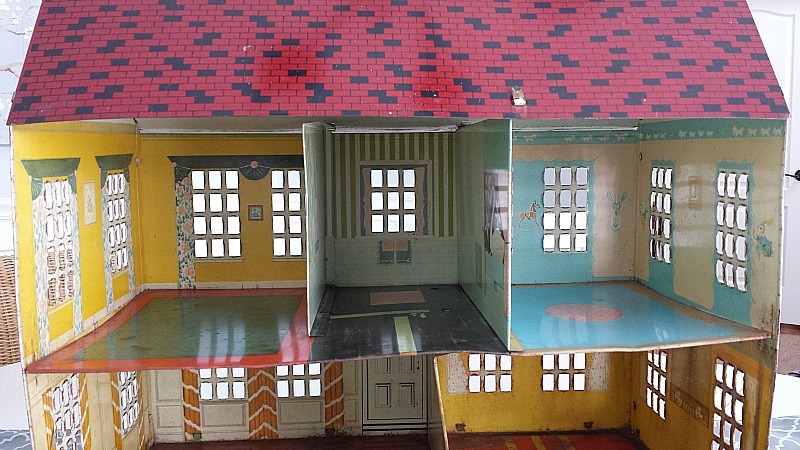 Most of the metal dollhouses were smaller that the 1inch to 1 foot (I”-1′) scale popular today. I would think velvet of other fabric glued to cardstock would nicely cover damage, and maybe cut out a “floor” from vinyl or plastic placemats for kitchen or bathroom or by front door. Thin sheet magnet on edges/ corner may keep them from moving. For display, maybe on top of a cupboard or bookshelves? I enjoyed this post so much. I’d completely forgotten that I had a “tin can” dollhouse in the 60s too. Not this particular one, but seeing the others at the place you bought this one brought back memories. Our church also had a BIG wood dollhouse in the children’s Sunday school area. My mother could hardly tear me away from it. 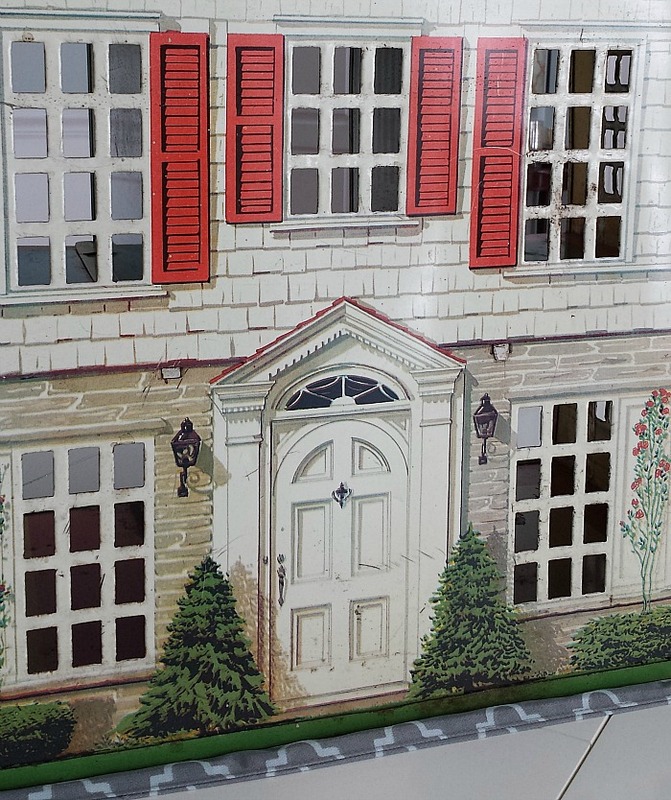 Yay, now you have your very own “Father of the Bride” house. 🙂 I’m curious if the plastic furniture was made by Renwal. I have a few pieces from my mom that look very similar- how fun to learn their history. Yes, this is probably the closest I’ll ever come to having my own FOTB house, so I’ll take what I can get! Ha. I LOVE it..a friend had a similar one when I was groing up..I have 3 wood dollhouses here..they were my daughters..and my daughters have sons..so 2 are in the attic..and one is in the kitchen on a top shelf. I am so glad you bought it..no matter how old I get..I love going back to that feeling of being a little girl..it looks pretty w/ the lights too! Boys can play with doll houses too. I got my older son a doll house when he was younger and he loved playing with it although his pretend was a bit different than what I pretended when I was little. I, for example, never had one of my dolls get eaten by a dinosaur. My younger son enjoyed playing with it too although he prefers Calico Critters. what a find !!! I have always wanted one of those, and I walked away from the few I had seen……maybe next time I will take some advice from your Lily !! I love yours ! I have 6 dollhouses that I’ve collected over the last few years to restore. One was a kit and I’m currently working on it (progress is on my blog). The others are waiting but I think about them often and just figured out the color schemes over the Christmas break when I had a few extra minutes to write it all out. Toying with the idea of either creating a separate page for the journey of each dollhouse or creating a whole new blog. So many decisions! Enjoy your dollhouse. I’m sure you’ll find just the right spot for it!! 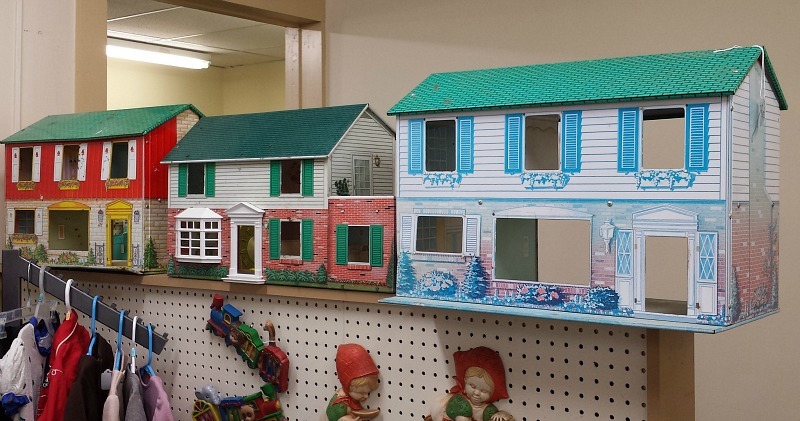 Those are some beautiful dollhouses and I want one of my own now! We don’t really have many antique stores around here so I wonder how hard it would be to build my own dollhouse? 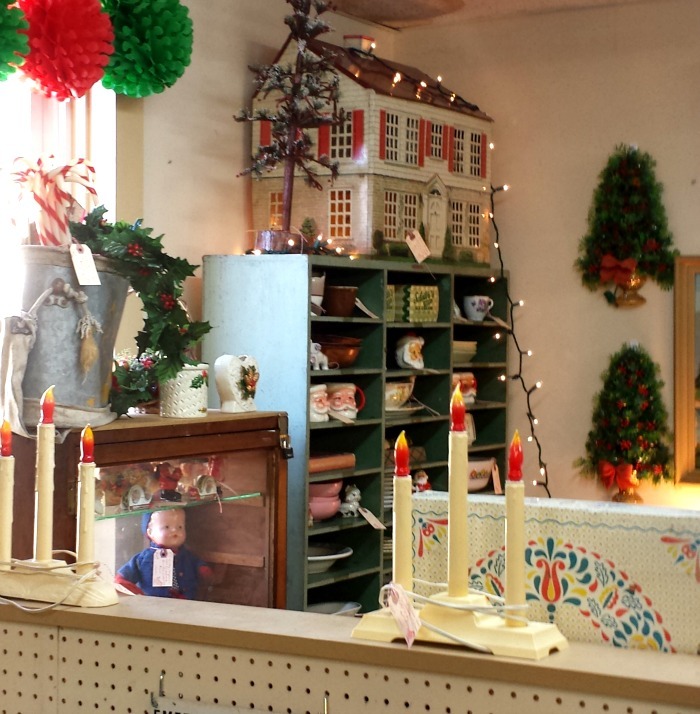 As soon as I saw the first picture in this post, I knew which antique mall you were visiting. And then I saw the house you bought – that one came from my booth! 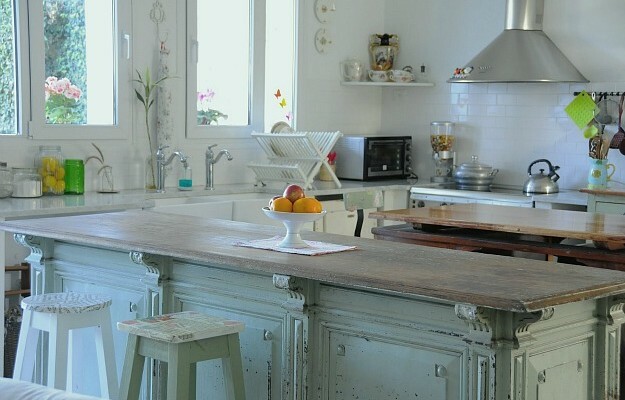 How fun to see these pictures on your blog, and I’m so glad that you are enjoying your new (old) house. I LOVE(!) the Santa mugs in your booth! Are they vintage or new? Wish I was there to grab them up! They’re all vintage. I love them, too, which must explain why I have so many! Hi Melissa! Her booth was on the second floor of That Shop in Milford, in the back left corner. Lots of fun stuff in it! She may have other spaces as well, but that’s where I found the dollhouse. I had a tin dollhouse when I was young, in the 60’s, but mine was a ranch-style. I remember being jealous of a friend who had a 2-story version! I am always drawn to these in antique stores, and I think if I find one similar to what I had I’m definitely going to get it. I look forward to seeing where yours ends up! 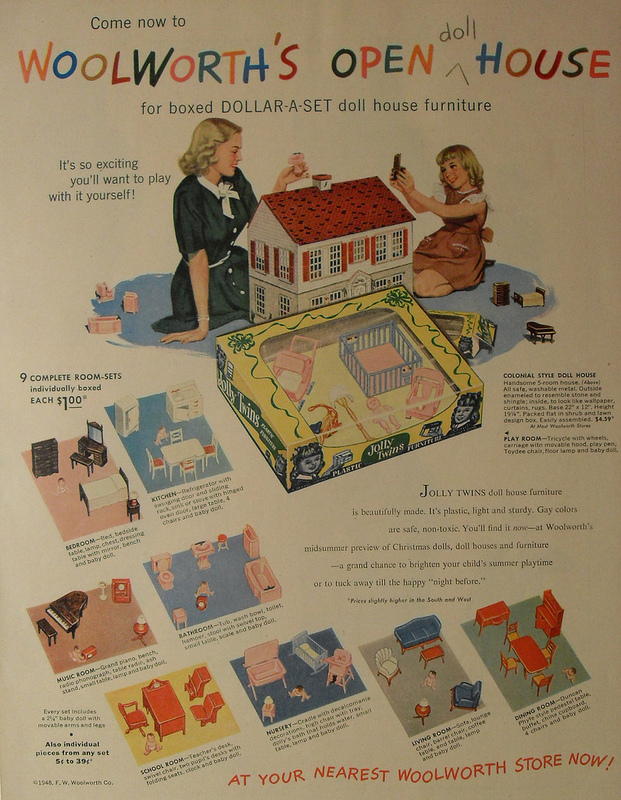 The doll house hobby is a popular one, especially up north in the US and in the UK. I am a newbie to the hobby and so far, have collected 6 houses. I don’t have a blog, but have several Pinterest boards involving many categories of doll houses. I don’t know how old your daughter is but perhaps the two of you might like to make some items for your house. It’s not difficult! Lots of fun! You will be surprised at what you can make from “trash” items. Lots of other informaation on Pinterest, too. Love your house! Boy does this bring back memories! I had one in the early 60’s that I would play with for hours. That should have been a clue that I would be interested in design. That would have been helpful when I was trying to figure out what I wanted to do with my life. Also…I’m reading on an IPad & most of your pictures are blurry to me. I had this issue on a different blog & the author said it was from a new version of WordPress. She was able to correct the problem. I thought I would pass it along. Maybe you could contact Dana from House Tweaking to see what she did. The pictures are fine now. Whatever you did fixed the problem. Thanks. I never met a dollhouse I didn’t love…I think a “hooked on houses” obsession starts with houses for dolls and just moves onward and upward from there. So glad you got one – it’s a beauty! What fond memories I have of playing with a dollhouse. 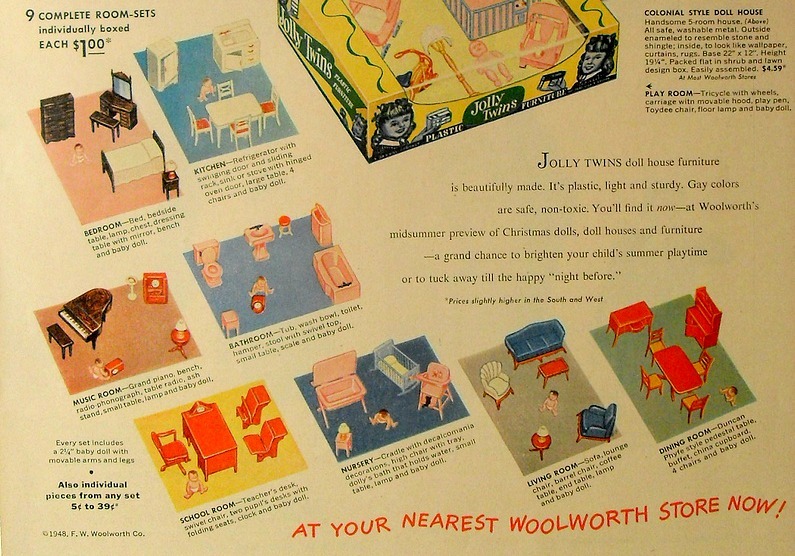 I had a tin lithograph similar to yours, with wall and floor furnishings, in the early ’50s. My husband constructed a wooden dollhouse in the 90’s for me as a Christmas gift. Our grandchildren enjoyed it. We are now waiting for our great grand, Addie. and other to be great grands to be old enough to enjoy it when they visit at our house. 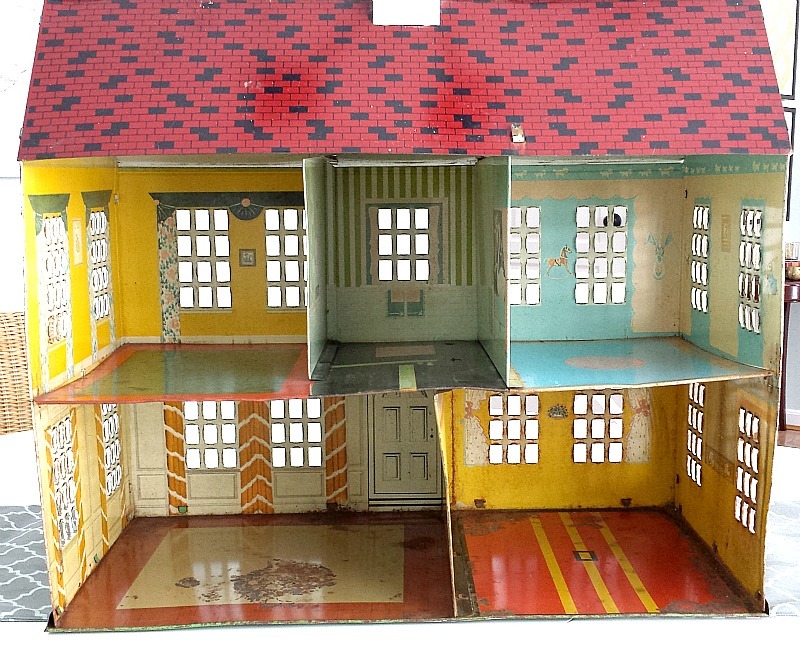 I have a 1930’s dollhouse made by the Rich Toys Co. It is made of lithographed pressboard, and is Colonial style with fat columns supporting the porch across the front. I have it furnished with wooden Strombecker furniture that belonged to my mother as a child. She let us play with her house and furniture, so I am very attached to it!. I have the house displayed on a big rolling stand that my father made in the 1970’s when my sister and Mom were working on the house together. On a large shelf underneath the old house, I have a modern dollhouse with unbreakable furniture. The grandchildren are allowed to play with that one to their heart’s content. This keeps them occupied, and they leave mine alone! I love the old house, and enjoy it every day. Julia, I have some Renwal and Plasco furniture that would look great in your new house (a sofa, armchair, coffee table, endtable, and a couple of side chairs). I would love for you to have it – just e-mail me if you’re interested. This post brought back so many wonderful memories! My grandma had the same dollhouse at her house and I would play with it for hours every time I visited. I just called my Mom to find out where that dollhouse is now, and while she isn’t sure what happened to it, we are now both on a mission to find it! Thank you for all the work you do on your blog – it is one of the few that I read regularly! I have a metal/tin colonial and all the furniture that I played with as a child. It now sits on the top shelf of a bookcase in the family room…..would not think of selling/giving it away. I am one of the people that mentioned blurry photos in the past but these photos are not blurry. I am on an iPad. Yay! So glad it seems to be resolved. Thanks, Dawn! Love it! And so appropriate for you. I, too, am one of those who had a similar metal two-story Colonial dollhouse in the late 50’s/early 60’s. I had it until a friend, who was rather large for her age, somehow managed to fall backwards (we were probably dancing or jumping around) and landed on it. Unfortunately, it was irreparably crushed. I had one of the “Marx” tin dollhouses in the 60’s. My father told me that on the Christmas Santa brought it to me, he had bandaids on all of his fingers from spending Christmas Eve inserting the metal tabs into the slots to assemble it! We later had a beautiful wooden dollhouse from FAO Schwartz, which I still have. It needs some work, you’ve inspired me to get busy! I had the middle house in your first picture, the red and green house. I loved mine. It came with plastic furniture. Wish I still had it. I got it in about 1965 or 1966 from an uncle who gave the best presents. I have been seeing a few of these around lately. Enjoy! And it would be adorable as Christmas decor, sitting on a sofa table, entry hall, or under the Christmas tree. Perhaps on the floor at the side of your daughter’s bed, or on her nightstand. Perhaps you will find some furniture throughout the year in various antique stores. Good for Lily for being persistent- it’s beautiful! I think it would look adorable decorated for all the holidays throughout the year, wherever you find a spot for it…….What really caught my eye in the pictures though, were the electric candles. We had those exact ones when I was growing up. We used colored Christmas tree bulbs for the lights. Great memories from Christmas past! I think I had this doll house as a child. I got it for Christmas in about 1955 or 1956 and enjoyed playing with it for many years before passing it on to a neighbor child. The colors don’t seem exactly like mine, but the exterior and layout is exactly like mine. I remember being very disturbed that there was no staircase and the people had to fly up and downstairs. I hope that I didn’t have that pink bathroom. If I did, it explains my hatred for pink bathrooms. As I recall, it had a door bell that really rang. I have this exact same house, but in better condition, plus all the Renwal furniture that goes in it, plus the original Renwal box the furniture came in. All the Renwal furniture can still be obtained on eBay and other online venues for a reasonable amount of money. Renwal pieces had little drawers that opened and other cute details. You can also use Petite Princess by Ideal furniture in this house, but that is higher end. Still, it can be gotten for reasonable prices. Collecting dollhouses is fun! I had one (circa 1960), very similar to this one. The highlight was the real overhead light in the living room that, for awhile, lit up. The thing I didn’t like about it was that the scale of the furniture it came with (and I have no idea whether it really did come with the house, or if my mother picked it out) didn’t match the scale of the graphics on the walls…but I see that the pictures you found of the furnished house shows appropriate scale. Nevertheless, I played with it for many years…have no idea what happened to it, which is surprising because my mother kept nearly all my toys. What a great find. I love it! Reading this post brought out my inner child and it makes me want to visit an antique shop now just for fun. 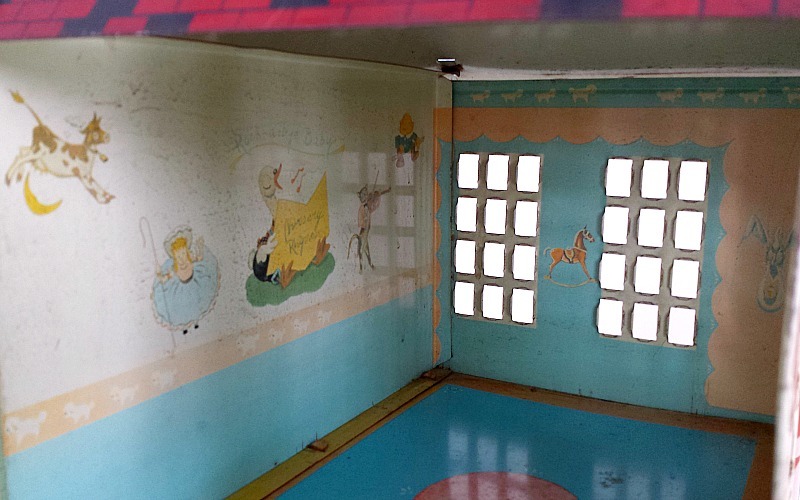 The dollhouses in the first picture remind me of the 1969 Fisher price ones that open and close. We had some of those growing up and this last summer, we stayed in a cabin that had the same ones. They were fun to play with again and they brought back good memories. I hope you can make good memories with your’s. Loved this post! I had a doll house in the 40’s that was very similar to the picture of the middle one with the roof top space. I had lots of fun furnishing it from Woolworth! Lily has some great ideas! Thank you, Julia, for a delightfuI post! I grew up loving dollhouses because we lived in an apartment and my idea of roominess was to live in a house. I can remember rearranging the dollhouse furniture for hours and I even had a little suitcase I would fill with furniture and take over to my girlfriend’s house so we could play with it. I now have a more modern Thomas Pacconi house that was my sister-in-law’s. I have it on a small white wood table I bought at the Christmas Tree Shop. The house came with a small, Lazy Susan-like turntable that fits on the bottom of it and allows it to turn from the front to the back. 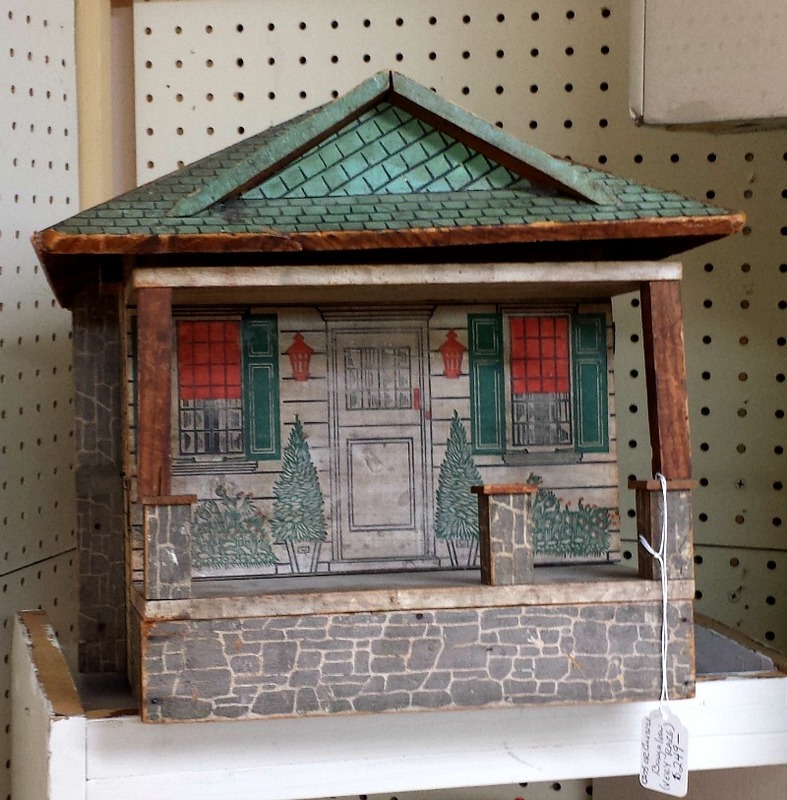 I have to admit I love dollhouses and love to look at them in antique stores and at tag sales. Don’t you get a kick out of thinking who owned your dollhouse and how many hours they whiled away playing with it and fixing the furniture and naming the dolls who lived in it? This is crazy good! And I gasped when I saw the dollhouse with the blue roof — I had that one (and had forgotten about it)! I’m glad you picked up the one you got; I would have too! I love the dollhouse you & your daughter bought. I think it would be a fun mother/daughter activity to begin collecting the furniture that originally went with the dollhouse. I had boys, but if I had a daughter, I would love a shared collecting hobby! My sisters and I had one like the blue and yellow one, but I think the exterior colors were different. My dad made a plywood platform for it, and we used the top of a Yuban coffee can upside down as the swimming pool — the metal looked liked reflective water. On ebay I just bought two oriental looking rugs for $2 each, and u can get some there too. 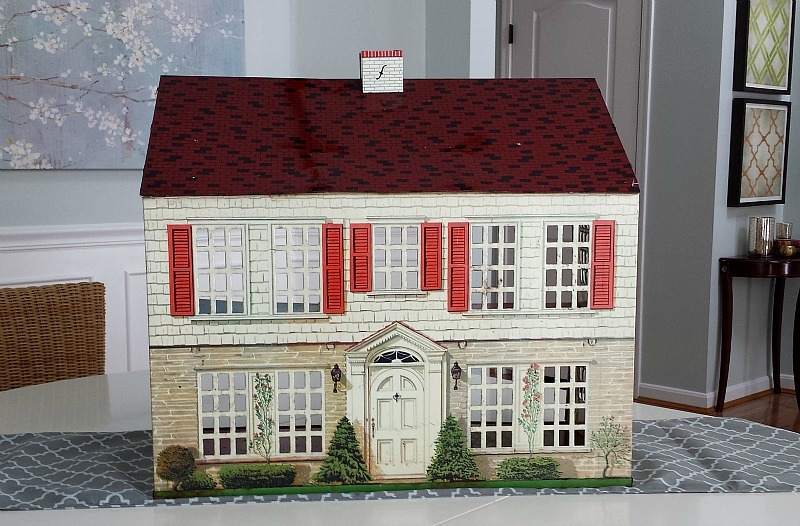 I just bought a $15 wooden dollhouse this summer and am furnishing it as if it were a French cottage. I painted the walls since they don’t have graphics like yours, not perfectly, but I want it to look old. I am having fun. Just ordered the bathroom for $4, made from wood, from ebay too. Have fun!! I love it. I think I had one as a kid. Oh, and you can get a nice fireplace for under $10. Hi Julia, what a beautiful post, I sadly never owned a dollhouse but have always been fascinated by them and I can see yours new treasure on it’s own table with battery operated fairy lights (they tend to be more delicate in size). My dad always bought me beautiful dolls for Christmas but my brother always managed to poke their eyes out, the tears would follow and I would refuse to play with the damaged doll. My sister still has her doll it’s still wearing a dress I made in high school with French embroidery (I was so proud of my handy work). Julia thank you for sharing beauty. Till next time regards Esther from Sydney. PS I’m going to see if I can find anything about doll houses over here. Oh, before I forget Lily thank you for your persistence, I love it. I love your vintage doll house. How cool, that you found all that info on that exact house! I too, recently bought a doll house for my daughter. One day this fall, she mentioned that she had some plastic doll houses, but none that looked like our home. There began my online search for a reasonably priced Victorian style doll house. I found a local one on Kijiji. When I went to pick it up, the lady told me her daughter had reluctantly given it up, when she told her the money she made from selling it would go toward new things for her first apartment. 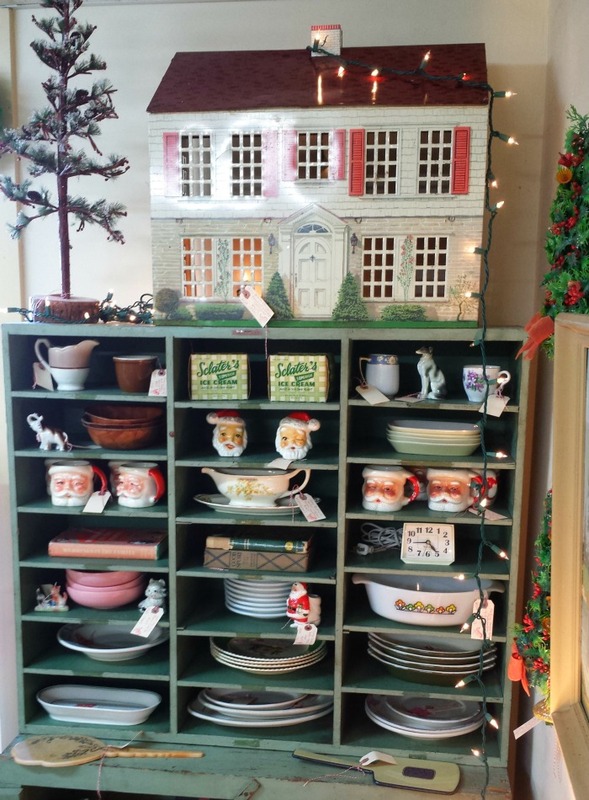 It’s absolutely adorable, complete with handmade and painted furniture and accessories. The look on my little one’s face, when she saw it under the tree, was priceless. I had chosen the perfect present. She turned to me and said “Mommy, Santa’s elves built this for me!” The novelty hasn’t worn off. She has the house on her nightstand, and takes everyone who is willing upstairs to her room, to see her “beautiful” doll house. I admit that I’ve been in a few times myself, just to rearrange things. A nostalgic toy like this brings out the child in all of us. Oh, wow, I love that you found one that looks like your own Victorian, Alie! And your daughter’s reaction was priceless. Love it. While I’ve never had a vintage dollhouse, I did have a marvelous one made by a cousin, and it was truly amazing, but being the 80’s girl that I was, I asked for a traditional, store-bought upgrade. Then, after a year of glueing on cedar shake roofing shingles, I got bored of it, discovered boys, and now that sad shell sits in my basement. I refuse to get rid of it. 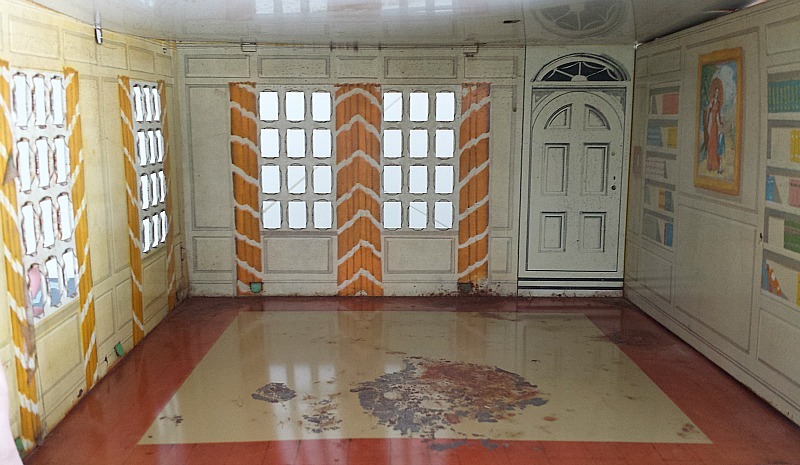 My boys used it briefly, but I really hope to finish it – I think it might be the only house I can really afford to renovate. 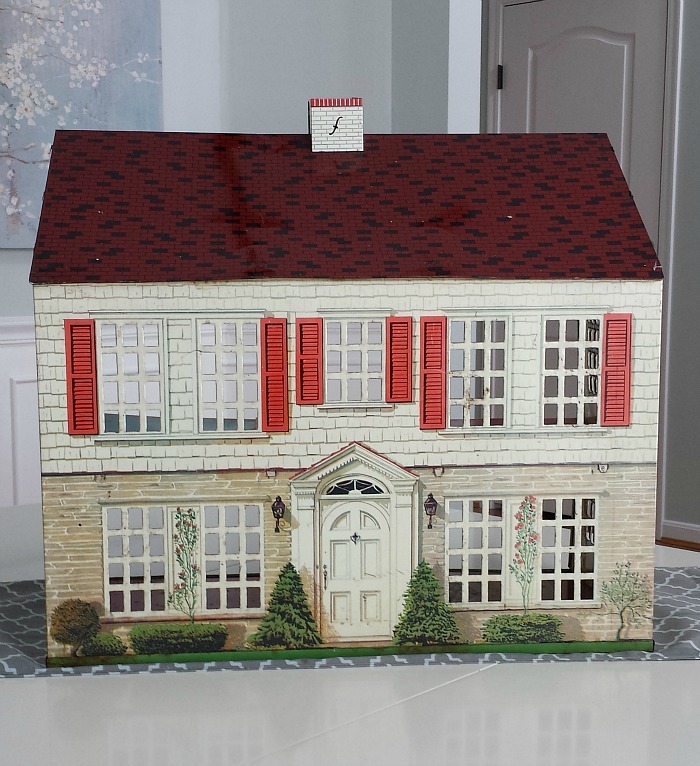 I have 3 dollhouses & one cottage kit to build! Yep, hooked. I love making miniatures for the interiors. One house was a very rundown plywood Victorian a friend was getting rid of so I adopted it & refreshed it into a Caribbean/key west tropical Inn. Another is a ’70s lundby I found at an estate sale & for $20 seemed a very good deal..this is my Brady Bunch house (my hallmark TV ornament is a perfect fit) & then I have one stored away and that was my first, the one I bought for myself since I never had one as a kid. Funny, that today I went to habitat for humanity store looking for something & stumbled upon new in box mini furniture..super cheap & so it came home with me. Julia, I have this exact dollhouse and I love it. I do decorate it for the holidays with mini-wreaths, snow, and snowmen. I have three other vintage, metal dollhouses and three vintage metal barns. The Colonial rests in the formal parlor of our old farmhouse, while the others sit atop a Welsh cupboard in our dining room. The barns are scattered throughout the house. I do not own any furniture for these houses, but that might be my next endeavor. Would like to buy one in good condition. It will be going to a home that will give it love! Such fond memories! When I was young, my mom surprised me one Christmas (I think) with a homemade doll house! She used a medium sized box turned on it’s side, covered the outside with fabric and put a handle on top for us to carry it around as needed! She closed up the front with a button and elastic fastener. The inside was divided into I think four room decorated with wallpaper and carpet samples, including window curtains made out of scrap fabric. She made some of the furniture and we had fun adding our own homemade furniture as well! She still has the dollhouse, which each of her grandkids have enjoyed over the past many years! I love your doll house too! Definitely Father of the Bride! Thank you for your post which took me back to my childhood! By the way would you be willing to share the name of the Antique Shoppe you found this at? I am always looking for new places to visit here in Cincinnati! Oh my… I DO have this house….. it was my mothers and I use it under my tree each year… I could send you a pick all lit up if I can figure out how to get a pic to you…. I remember playing with that same furniture when I was little, long gone now….. but yes I have this house! hello! I LOVE your site and would never ‘unsubscribe’…but on to the dollhouse you recently bought. I had one of these to make over for a friend. I’ve built dollhouses and dioramas for forty years – abd have won several 1st Place ribbons at our annual miniatures show in Florida -…but you really don’t need to get candles for this house…go to Walmart and find those little round ‘candles’ that run on a battery..they will work beautifully! And Lily – love her name – will love them! So cheap..about four or five in a package…I have over thirty boxes of really wonderful pieces of doll furniture – and just sold an expensive dollhouse with elec lites and hardwood slatted floors, etc…if I could just sell this furniture!! Good luck with the dollhouse…they’re addictive, let me tell you! What a great find, those old doll houses are so charming. I did not have a doll house growing up, but many of my friends had those pink Barbie palaces and even then I did not like plastic furniture. Thanks to your daughter for this one! I’m clearly behind in reading your blog, but I just saw this and had to comment. I have two of these doll houses with furniture in my basement I inherited from my grandmother. I played with it as a little girl for hours at her house and lived it. Since I have boys, they have not been getting much use. It never occurred to me to put it on display! What a great idea send now I have a reminder of grandmother all the time. I’m obviously behind in reading your blog, but I definitely have a thing for dollhouses. I have one in the basement that was given to me by my Grandparents when I was 10, but was never assembled. Another vintage kit I bought at an auction, also waiting in the basement for me to assemble it. And a beautiful vintage one that I bought for my girls (okay, for me) for Christmas 2 years ago, complete with furnishings and electricity! Oh, my, it is beautiful and, um, large. It lives on top of a short dresser so that the girls can play with it and the dresser has wheels so it can be moved in and out of a corner pretty easily. 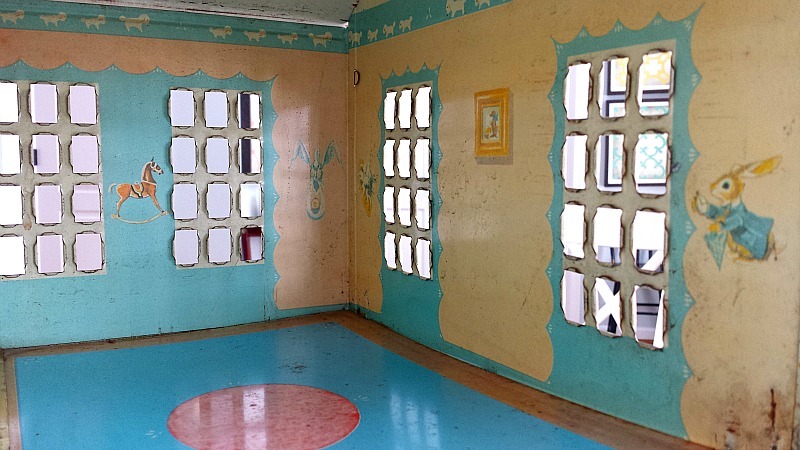 Never had one as a child, so I was so thrilled when I bought a few years ago a panoramic single storey, six sided house on mini casters… It’s from the 1960s. You spin it around to see the rooms… I printed a teeny weeny image of Frank Sinatra and he stands in the living room, and I put mini photos of Ava Gardner In the guest room, using peel and stick magnetic sheets so they will stay firmly on the walls. Printed off some mini Life magazines for the coffee table… The walls are tin with images and the base and ceilings are press wood. My guilty pleasure is owning this little house! Welcome to the club!